A Feast of Giving or of Poison? At an International Cinema lecture, French professor Anca Sprenger looked beyond Babette’s Feast as a masterpiece of culinary cinema and pointed to other elements of the film that have made it the work of cinematic art it is today. PROVO, Utah (March 10, 2015)—Though watching Babette’s Feast will unfortunately not feed your body, it will at least feed your soul. French professor Anca Sprenger discussed the subtle but important messages about sacrifice, gifts and revenge that appear in the 1987 Danish and French film Babette’s Feast at an International Cinema lecture, showing that it was perhaps less about food and more about art. Babette’s Feast was created in 1987 by Gabriel Axel, a Danish film director and writer. The film was based on a story originally written by Karen Blixen (also known by her pen name Isak Dinesen), a Danish author best known for her controversial memoir Out of Africa. Babette’s Feast was initially screened at the Cannes Film Festival in France, later going on to win the Academy Award for Best Foreign Language Film that same year. Sprenger continued that when French opera singer Achille Papin arrives in Jutland he falls in love with Philippa’s voice, trying to convince her to come back to Paris with him and become an opera star. To her father’s delight she rejects him, and the dejected Papin goes back to France. “This has been considered a food movie, which explains my presence here,” Sprenger joked. She said there are even restaurants in France and other countries that are still working on replicating the incredible dinner that Babette prepares in the film, the menu itself becoming a work of art. However, though the film is largely known for its artful representation of food, Sprenger said there are other directions in which to take the movie as well. “One of them is obviously religion,” Sprenger said. She explained that at the final feast there are 12 guests around the table, which draws a parallel to the last supper. Sprenger emphasized the element of sacrifice that is explored throughout the film. She said that when Babette wins the lottery she uses all of her money to provide a fancy dinner for the people in this religious sect who may not even appreciate it. Sprenger asked who was more Christian: Babette or the sect. She suggested that the film represents the opposition between preaching and living religion. The Protestant sect shows austerity by deciding not to express enjoyment or gratitude for the feast, yet Babette uses everything she owns to create a luxurious dinner. Sprenger also considered the element of the artist in the film. Babette and Papin both define themselves as artists: Babette as a chef and Papin as an opera singer. “One may wonder about the place of art in such a community where nobody seems to care about anything except basic life,” she said. Sprenger explained that Papin tried to seduce Philippa through his art but was rejected. She underscored the significance of the fact that Papin tried to seduce Philippa when the two sang a duet from Mozart’s Don Giovanni. In this opera, Don Giovanni, the great seducer, challenges the statue of the dead Commendatore, donna Elvira’s father, to come to a feast he was offering. The figure of the dead father comes to the feast and throws Don Giovanni into the flames of hell, Sprenger said. 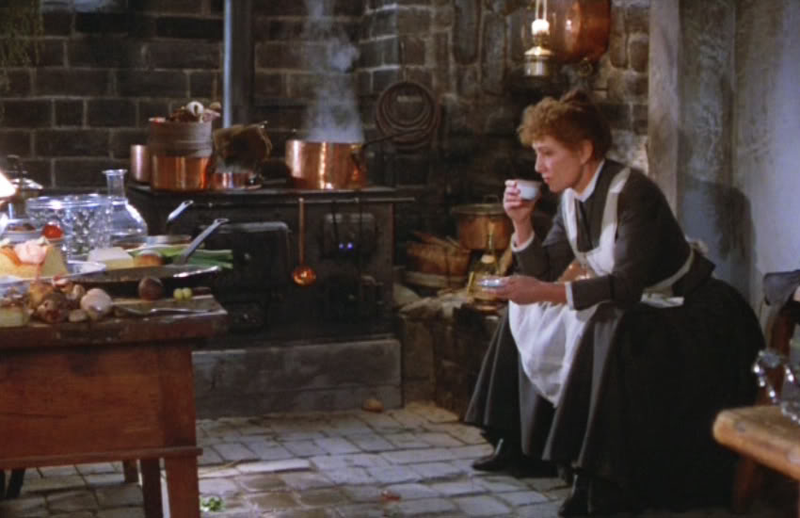 In Babette’s feast, however, it is almost as if the memory of the dead minister was sent to the flames of hell, since the small congregation is enjoying the feast more and more, Sprenger added. They gradually ignore the absurd rules of austerity and find happiness and love thanks to Babette’s culinary art. In the end it is Papin who triumphs through this feast, appearing as a vengeful Don Giovanni. She added that Papin probably knew what he was doing when he sent Babette to the two sisters as a gift, arguing that perhaps it was his form of revenge for being rejected. She added, however, that Babette is also a wonderful gift because they get to enjoy things they have never experienced before. Sprenger said that you can see the people in the sect become happier as they eat the feast, but in this happiness, there are doubts and regrets that come with it. Sprenger continued that as a result of Babette’s feast people would probably start doubting the rules and the life their minister brought to them. The seducer, she argued, does not suffer the final punishment. Perhaps it is Papin, the seducer who could not seduce, who gets the last word. For more information about upcoming films, visit International Cinema’s website.